But Health Minister KK Shailaja said the state government would follow the Supreme Court’s verdict. Kerala Devaswom Minister Kadakampayy Surendran said women activists will not be allowed to prove their strength inside the Sabarimala shrine, Mathrubhumi reported. While the state government will protect devotees, it will not provide protection to women activists trying to enter the temple, he said. Surendran’s remarks came as protestors continued to agitate against the Supreme Court’s order allowing the entry of women between the ages of 10 and 50 into the Sabarimala temple. The Left government in the state has decided to implement the court ruling and not file a review, while the Opposition Congress and the BJP have accused the state of showing “undue haste” in implementing the order. The National Ayyappa Devotees Association and the Nair Service Society have filed review petitions in the top court. The temple gates opened to devotees on Wednesday amid violent protests against women devotees and journalists. Several women attempted to trek up to the hill shrine on Friday, including activist Rehana Fatima, journalist Kavitha Jakkal, and a devotee Mary Sweety. Jakkal and Fatima abandoned the trek amid protests, and Sweety said there was no option but to return. Two unidentified people on motorbikes even hurled stones at her house, reported the Hindustan Times. The police reportedly took Sweety back to the Pamba control room and told her that they would be unable to provide security for her trek. But Shailaja said that the state government will follow the Supreme Court’s order. “The government is not interested in violating rights of devotees, and it will not force its way through,” News 18 quoted her as saying. 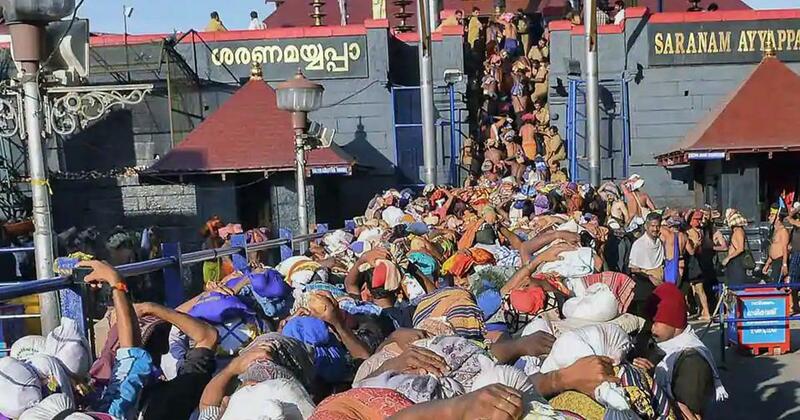 Sabarimala chief priest Kandararu Rajeevaru said the temple will be closed if women reach the ‘pathinettam padi’ (18 sacred steps) and the keys will be handed over to the Pandalam royal family, reported Malayala Manorama.